Understanding the topographic characteristics of graphene and its interaction with the supporting substrate, therefore, is crucial for further development of nanoelectronic devices. as the interfacial structure related to its mechanical properties of graphene when attached to a reconstructed silicon surface. The fitness between the interfacial structures plays an important role in stabilizing the attached graphene and forming pattern. The degree of planarity of the attached graphene determines the magnitude of the residual stress, while temperature affects atomic bonding and varies this residual stress. Findings suggest that the different pairings between graphene and surface structures significantly affects the topographic characteristics, residual stress, and interaction strength of the graphene sheet, which further changes the electronic properties of its application. The mechanical properties of finite-length (6,0)/(8,0) single-walled carbon nanotube (SWCNT) heterojunctions with respect to different kinds of connection segments, either coaxial or bias, are investigated using molecular dynamics simulation calculations. In contrast to the general minimization approach, Genetic algorithm (GA) is more powerful to generate the stabled structures with global minima energy. Several heterojunction structure are founds. The results obtained by density function theory show consistent result with MD simulation. The number and orientation of stone-wale defect strongly influences the mechanical properties. The heptagon ring plays the important roles to affect the deformation mechanism. The measured properties of a synthetic C84 monolayer on the silicon subrate (C84/Si) are comparable to that of SiC, which has the potential to scale down the size of corrent electronic device. The nanoindentations of C84/Si are explored by simulation and further verified by experiment (AFM). 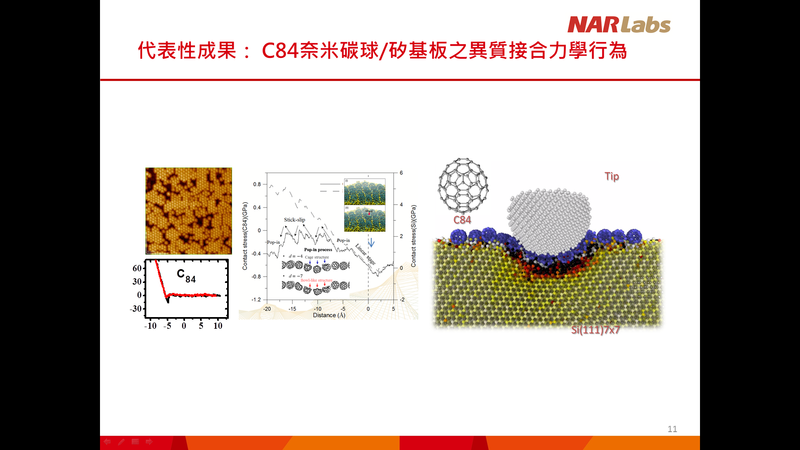 The coverage of C84 molecules increases the mechanical properties of the Si substrate, and plays the role of a damper or cushion which disperses the compression stress on the substrate. Such a nanoindentation simulation model provides a powerful way to understand at an atomic level the interaction of the parts of an interface, and of the system as a whole; The effects of the interface and thickness on mechanical properties have been investigated by modeling the nanoindentation of a MMA thin film on Au substrate. The result shows that the indentation force is influenced both by the layer structure and by the thickness of the MMA film. The thinnest case exhibits different deformation behavior than the thicker cases. The structure of nanowire becomes different with the diameter is smaller than 2nm. The mechanical property and material characteristics of those ultrathin nanowires nanowire and crystalline nanowire have been investigated (Au, SiO2, TiO2, ZnO2). It is found that the structures are change due to the strong surface tension, which therefore varies their intrinsic physical properties. For the ZnO nanotube, we found that it undergoes the phase transformation when exerts a mechanical loading. Our results show good agreement with experimental results and predicted results which, though they had not been found at that time, were later proven by experimental results.